PREMIUM DOCK soon to be available again. Mega yacht heaven. ONE CANAL OFF INTERCOASTAL. longterm premium dock , pls contact us with specifics and desired start date. BRAND NEW TREX DOCK, 24" cement square pilings. Marble deck. 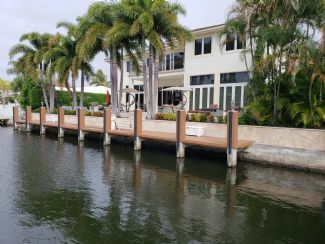 BRAND NEW Dock is 80 feet long with electricity and water located at 3901 NE 31st. ave Lighthouse point on the Realto Canal which is the canal that the Lighthouse Point Yacht club is located. 10 min from the Hillsboro inlet and is trex decking with cement pilings marble stairs. secure/Private access to dock. Taking waiting list now.